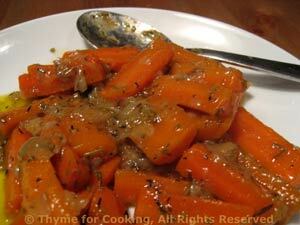 Buttered Carrots and Shallots, Thyme for Cooking easy sides. Quick and simple, I always have carrots on hand to 'fill in' when I run low on other vegetables.... besides, I love them! Heat oil in a small skillet. Add shallot and sauté until translucent, about 5 minutes. Peel carrots, cut in half the short way so you have 2 - 3 inch lengths. Cut in half the long way then cut each half again so you have carrot sticks. Add carrots, stock to skillet and cook over low heat until done, 10 - 15 minutes. Add butter, herbs and toss to coat. Let fry a minute or two and serve.